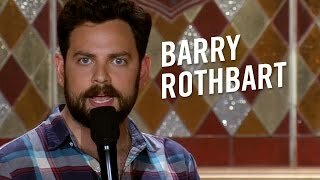 Barry Rothbart has been a stand-up guest on the Tonight Show with Jay Leno, Conan, The Late Late Show with Craig Ferguson, Adam Devine’s House Party on Comedy Central. He was named a “New Face” and “Best of the Fest” performer at the 2011 Just For Laughs Montreal Comedy Fest, and was again honored at the festival in 2013 as one of Variety’s 10 Comics to Watch. Barry can be seen in Martin Scorsese’s WOLF OF WALL STREET and Demetri Martin’s recent feature DEAN. He also stars in 300 SUNNYSIDE, a Comedy Central digital series alongside Betsy Sodaro, Nick Rutherford, Chris Reinacher, and Brian Huskey. His album, Streets of Fire, was recently released by ASpecialThing Records.